Trump made a fetish of demonizing undocumented immigrants, to the point of obsession. Nothing has been more important to his presidency. At his home on the misty slope of Costa Rica’s tallest mountain, Dario Angulo keeps a set of photographs from the years he tended the rolling fairways and clipped greens of a faraway American golf resort. Angulo learned to drive backhoes and bulldozers, carving water hazards and tee boxes out of former horse pastures in Bedminster, N.J., where a famous New Yorker was building a world-class course. Angulo earned $8 an hour, a fraction of what a state-licensed heavy equipment operator would make, with no benefits or overtime pay. But he stayed seven years on the grounds crew, saving enough for a small piece of land and some cattle back home. Now the 34-year-old lives with his wife and daughters in a sturdy house built by “Trump money,” as he put it, with a porch to watch the sun go down. It’s a common story in this small town. Other former employees of President Trump’s company live nearby: men who once raked the sand traps and pushed mowers through thick heat on Trump’s prized golf property — the “Summer White House,” as aides have called it — where his daughter Ivanka got married and where he wants to build a family cemetery. The Washington Post spoke with 16 men and women from Costa Rica and other Latin American countries, including six in Santa Teresa de Cajon, who said they were employed at the Trump National Golf Club Bedminster. All of them said they worked for Trump without legal status — and that their managers knew. The former employees who still live in New Jersey provided pay slips documenting their work at the Bedminster club. They identified friends and relatives in Costa Rica who also were employed at the course. In Costa Rica, The Post located former workers in two regions who provided detailed accounts of their time at the Bedminster property and shared memorabilia they had kept, such as Trump-branded golf tees, as well as photos of themselves at the club. The brightly painted homes that line the road in Santa Teresa de Cajon, many paid for by wages earned 4,000 miles away, are the fruits of a long-running pipeline of illegal workers to the president’s course, one that carried far more than a few unauthorized employees who slipped through the cracks. 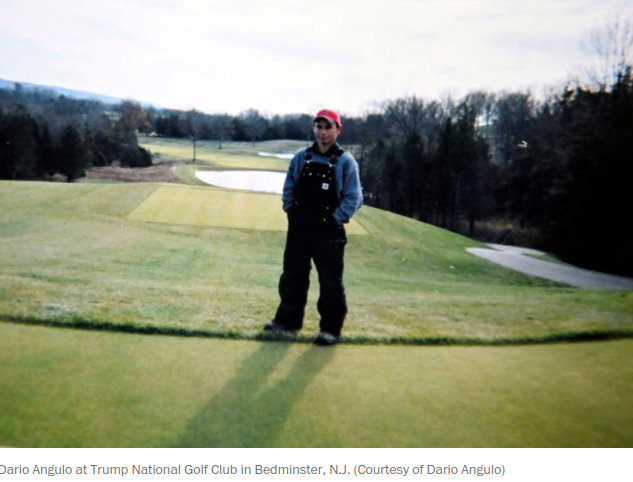 Soon after Trump broke ground at Bedminster in 2002 with a golden shovel, this village emerged as a wellspring of low-paid labor for the private club, which charges tens of thousands of dollars to join. Over the years, dozens of workers from Costa Rica went north to fill jobs as groundskeepers, housekeepers and dishwashers at Bedminster, former employees said. The club hired others from El Salvador, Mexico and Guatemala who spoke to The Post. Many ended up in the blue-collar borough of Bound Brook, N.J., piling into vans before dawn to head to the course each morning. Their descriptions of Bedminster’s long reliance on illegal workers are bolstered by a newly obtained police report showing that the club’s head of security was told in 2011 about an employee suspected of using false identification papers — the first known documentation of a warning to the Trump Organization about the legal status of a worker. Other supervisors received similar flags over the years, including Bedminster’s general manager, who was told by a worker from Ecuador several years ago that she entered the country illegally, the employee said. Eric Trump, a son of the president who runs the Trump Organization along with his brother Donald Trump Jr., declined to comment on the accounts by the former workers. Bedminster managers did not return requests for comment. I wrote earlier about how stunning it is that Trump thought he could run for president and not draw tremendous scrutiny to his businesses. That for two years as president neither he nor his spawn ever considered that hiring undocumented immigrants might surface in the news is simply mind-boggling.